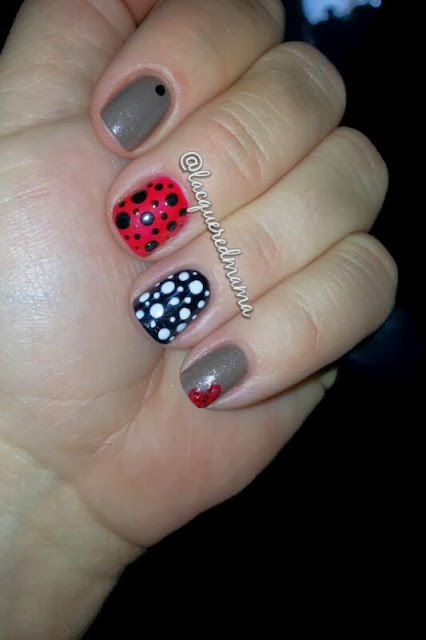 I have recently had an extreme love for polkadots! I'd have to say it all started when I began following @youngwildandpolished on Instagram. She is amazing! 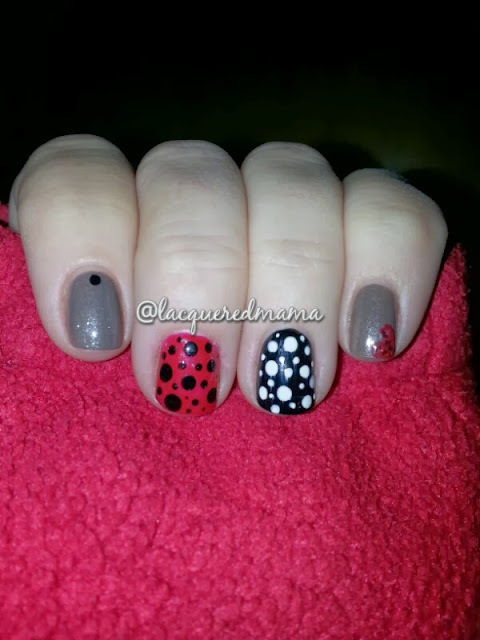 For this mani I used GoGo Girl and Taupe it Off by Sinful Colors, as well as Black and French White Créme by Wet n' Wild. All topped of with Sally Hansen's Dries Instantly topcoat. 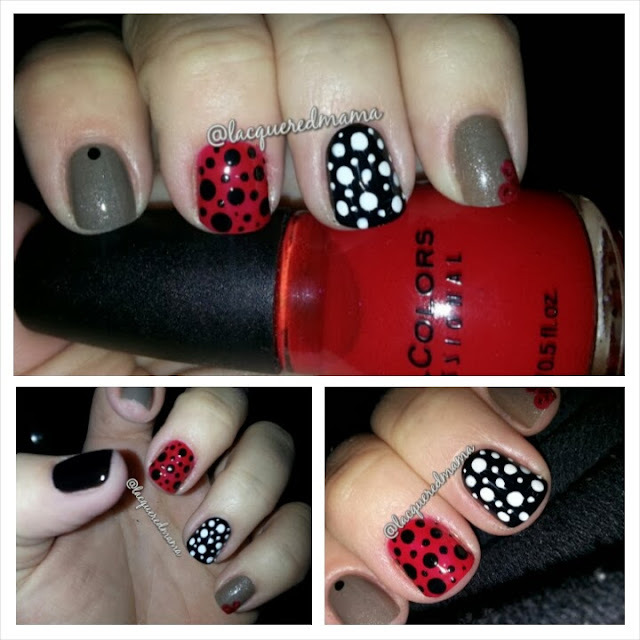 As far as the polka dots are concerned, I have yet to purchase a dotting tool (though I really want one!). I made due with things I found around the house. For the largest dots I used the end of a paintbrush, for the medium size I used the tip of a large paperclip and for the smallest dots I used a toothpick. (I know, I know...but hey, you gotta use what you have). The Sinful Colors Taupe it Off is from their "leather" textured line. It actually dries into a leather like matte polish. I personally didn't care for it, as it looked very dull. After I topped it with the topcoat though, I LOVED it! It has a very subdued holoed glittery appearance and sparkles in the light. So pretty! I did 3 coats of the polish with 2 topcoats. The Sinful colors GoGo Girl is beautiful. It went on very smooth and only took 2 coats with 1 topcoat. This will likely be my new go to as far as red are concerned. As for the Wet n' Wild polishes, they are better than I expected for being so cheap. The black is almost opaque with only 1 coat, though the white takes at least 3. I hope you all enjoyed my first actual nail blog! I am excited to do more reviews in the future. My goal is to find a polish that hasn't already been blogged about 100 times. Great! !had a nosey round all good.